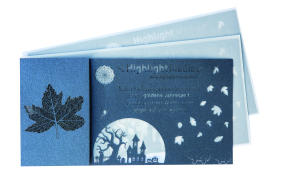 A laser embellishment on high-quality Fedrigoni fine paper turned the Autumn Mailing of Highlight Media into a design highlight in the letterbox – and into a winner of the Promotional Gift Award 2017. The mailing inside a transparent envelope that was distinguished in the category Customising Technologies doesn’t require any ink and its attractive design is already recognisable from the outside. The interior of the exceptional consignment creates a surprising effect: The folding element branded with a filigree autumn design conceals Christmas motifs, which are revealed when the flap is folded open. This is a graphic way of communicating the change of season from autumn to winter and of advertising a new fashion collection for example, a special event or seasonal item. A further advantage: Christmas greetings can be sent much earlier and not at the last minute. The Autumn Mailing is made out of FSC-certified paper, the laser is powered 100% by renewable energy. The laser embellishment allows the mailing to be adapted to suit individual requirements.